Communicate Science: "Opposite the window of the room in which I write is a field, liable to be overflowed..."
"Opposite the window of the room in which I write is a field, liable to be overflowed..."
In the last few months, I've written extensively on the subject of George Boole and his legacy in Cork and, in particular, his former home at Grenville Place. Number 5, Grenville Place suffered a severe collapse last month and has subsequently required significant partial demolition. While I don't believe last year's severe flooding in Cork City centre (the first anniversary of which was marked on Friday last) was a significant cause of the collapse, it appears that Boole could have warned of us of the possible dangers faced by this part of the city. 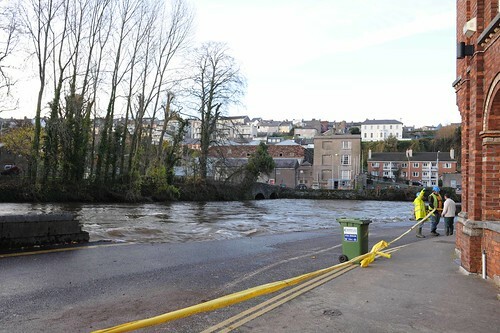 Grenville Place is one of two sites in the city where the quay wall was demolished by the impact of the flood waters. One year on, the sandbags still remain in situ and the historic quay walls remain in ruins. According to the Boole collection of papers in UCC's Boole Library, the emminant mathematician was in Cork during the 'Great Flood' of 1850 when he was trapped upstairs in his lodgings at Grenville Place and his friends were forced to traverse the streets in a boat. How familiar this sounds to those present near Grenville Place last year. Number five was where Boole wrote his most important work: An investigation into the Laws of Thought, on which are founded the Mathematical Theories of Logic and Probabilities. "Opposite the window of the room in which I write is a field, liable to be overflowed from two causes, distinct, but capable of being combined, viz., floods from the upper sources of the River Lee, and tides from the ocean." This field now forms part of UCC/Mercy Hospital lands at Distillery Field and is traversed by Cork City Council's Banks of the Lee walkway. The site suffered severe flooding on November 19th 2009. Ironically, opposite the window of the room in which I write is the same field and as we have again seen, it is liable to be overflowed.